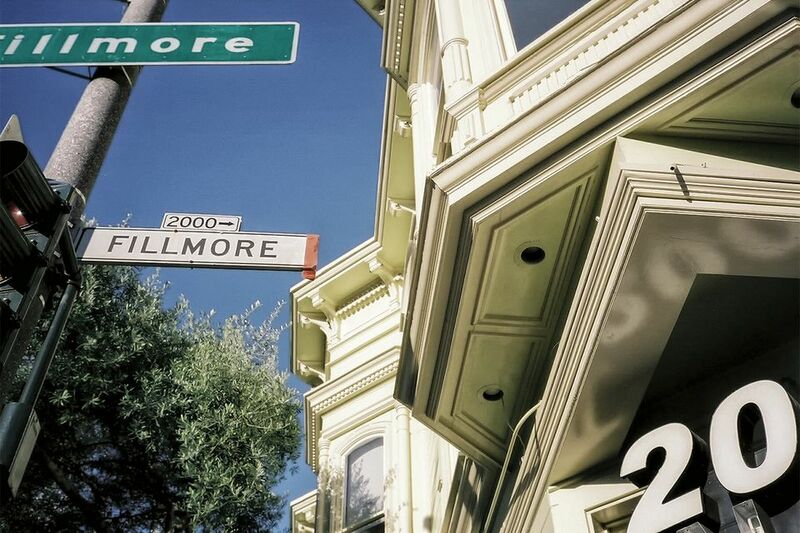 If you're looking for a place in San Francisco where residents outnumber tourists, where you can get a glimpse of what life in the City by the Bay is all about, try Fillmore Street or as San Franciscans call it, The Fillmore. It may not generate as much buzz as other parts of town like the Mission District or Potrero Hill, but it's an interesting place to go — and much calmer than some of the better-known neighborhoods. Fillmore Street has a laid-back, neighborhood feel. Businesses catering to the residents mix with innovative boutiques and world-class restaurants. You'll find plenty of coffee shops and bakeries that are perfect for relaxing and people-watching. The best time to go is midday for shopping or in the early evening for dinner. After dark, it gets quiet — fast. Even better, if you get tired of walking and shopping, you can go just one block west of Fillmore on Washington Street to Alta Plaza Park and climb its grand staircase for a sprawling city view you won't forget. San Francisco's Japantown is so close to Fillmore that you can also visit it while you're there. Here's what you can do in Japantown. If you spend any time in The Fillmore, you're bound to do some shopping. Window shopping is a leisurely activity and safe for your pocketbook in the morning; many stores don't open until midday, some are closed on Mondays and most are closed on holidays. You'll find a few chain stores, but most of them are locally-owned businesses offering home furnishings, clothing, and gift items. Several vintage clothing shops and upscale thrift shops on Fillmore Street offer bargain-hunting opportunities. Or you can go upscale and shop for antiques instead. It's fun to browse along Fillmore and let the shops surprise you, but if you can't resist getting over-prepared before you go, you can find out about all the shopping options ahead of time. You'll find plenty of places to eat on Fillmore Street, with cuisines from around the world. One of the easiest ways to pick one is to walk around, checking menus and seeing where the crowds are gathered. You can also consult Yelp or another app that provides restaurant reviews and ratings. That approach will help you find places on nearby side streets like Gardenias at 1963 Sutter. The Clay Theatre (2261 Fillmore) shows art and independent films. Nearby in Japantown is the AMC Kabuki 8, where you can get a bite to eat and take your bar drinks with you while you watch a movie in the upstairs balcony or at some over-21 screenings. The Fillmore Auditorium (1805 Geary St.) has been the site of concerts and shows in San Franciscans for almost a century and still hosts a wide range of performers. The San Francisco Juneteenth Festival is the second-largest festival of its kind. It commemorates the 1865 Emancipation Proclamation and is held on the weekend nearest to June 19th. Every Fourth of July, Fillmore Street is the site of the Fillmore Jazz Festival, one of the city's most vibrant jazz and arts festivals. It's the largest free Jazz festival on the West Coast, drawing over 100,000 visitors. The Salsa Festival also happens in July. Fillmore runs all the way to the San Francisco Bay near the Marina, but the eight block long section between Geary and Washington is the one described above. It's west of downtown San Francisco. To get to the Fillmore shopping area by car, take Geary Blvd west across Van Ness and turn right onto Fillmore (just after you pass the Japantown tower). You can also take a city bus or ridesharing service to get there. Parking is scarce in the Fillmore area. Metered streetside parking spaces are seldom available, and you can count on a parking ticket if you let the meter expire. Try the Pacific Medical Center garage on Webster between Clay and Sacramento or the Japantown Center lot at Fillmore and Geary.